Happy New Year, friends! Sorry for the late post, I accidentally saved this as a draft instead of publishing it. Whoops! This week's EtsyInspired challenge shop is Muffa. They offer the cutest miniature animals, gnomes and fairies. These items are meant for collecting or adding to your doll house. I can't even imagine the precision that goes into making these adorable little guys! I would NEVER be able to make something like this! But if you feel that you want to, Muffa does offer some PDF patterns so you can make a few things at home too! This week, Muffa is offering up an adorable tiny goldfish to one winner! I wish I could win it! Soooo cute! This week's sponsor is Dude Time Doodles. They are offering up a digi stamp package for the winner of 4-8 digi images. Here's my card for this week, inspired by the snowman above. I used a bunch of Cosmo Cricket Mitten Weather for this card. 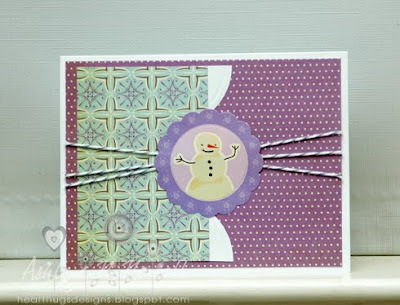 I also used the Card Patterns sketch for this card. Wonderfully inspired card! 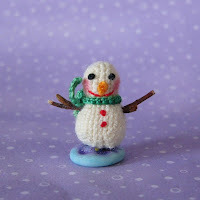 I love that your snowman has the purple around it just like the Etsy shop's image. cute cute Ash!!! Happy New Year my friend!! Adorable card Ashley and love the layout! Aw SO cute! I love how you've done the scallop behind him! Happy New Year, I'm really looking forward to being on the team with you all! This card is adorable! Love that snowman! The layout is amazing too! Love that bakers twine! I just love this etsy shop! The little minis are soo cute!! Super adorable. Love the colors and the twine. So happy to be on the EIC team & Happy New Year to ya! This card is definitely worth the wait- it is totally adorable!! Happy New Year!! SUCH a cute card!! I love your take on the Snowman! He's SOOOO cute!The layout is SUPER awesome and I love love love the patterned paper for this project! How cute!! Love Mitten Weather and I just want to hug that little snowman. I seriously need some twine. Who did you get yours from?? Perfect sketch!